It's now officially Spring. I want you to come with me on another walk in Nottingham. I know you want to.You don't always say so, but I know. We'll stick close to the river, then we'll find a park. ﻿ We'll start here on the City side of Trent Bridge. I often start my day here with a cup of Cappuccino, and an occasional bacon cob. You can see so many sights from these tables. Nottinghamshire County Hall; Trent Bridge Cricket Ground; Nottingham Forest Football Ground; Rushcliffe Civic Centre and the floodlights from Notts County Football Ground. 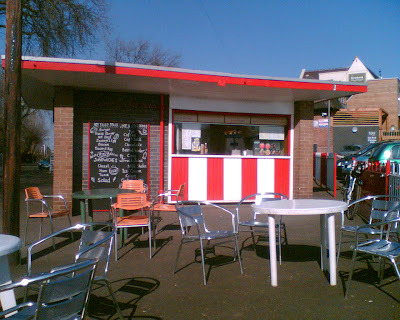 But I think best of all is that the Kiosk is right beside the River Trent. Fortified with coffee and cob, we'll head west along the route of the river, then turn north to find the park. 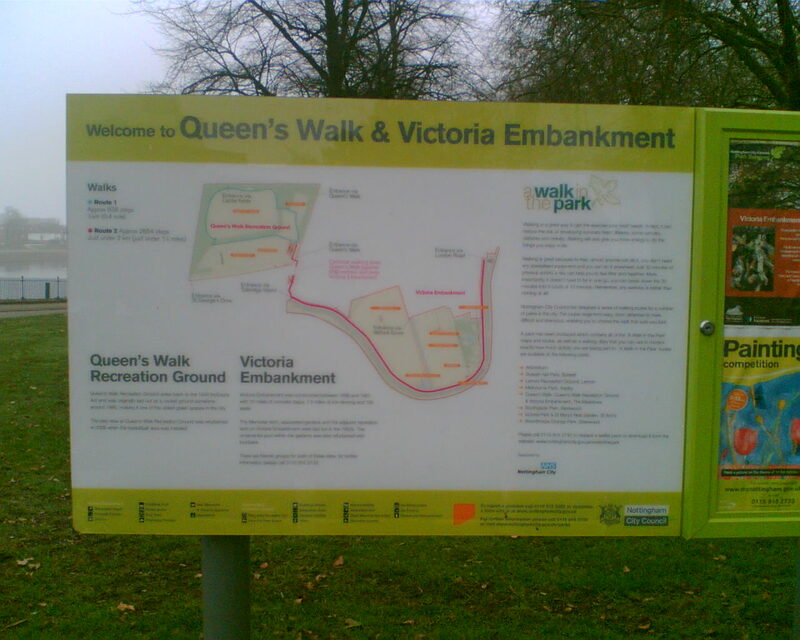 The journey begins at Victoria Embankment. I love this part of the Trent. 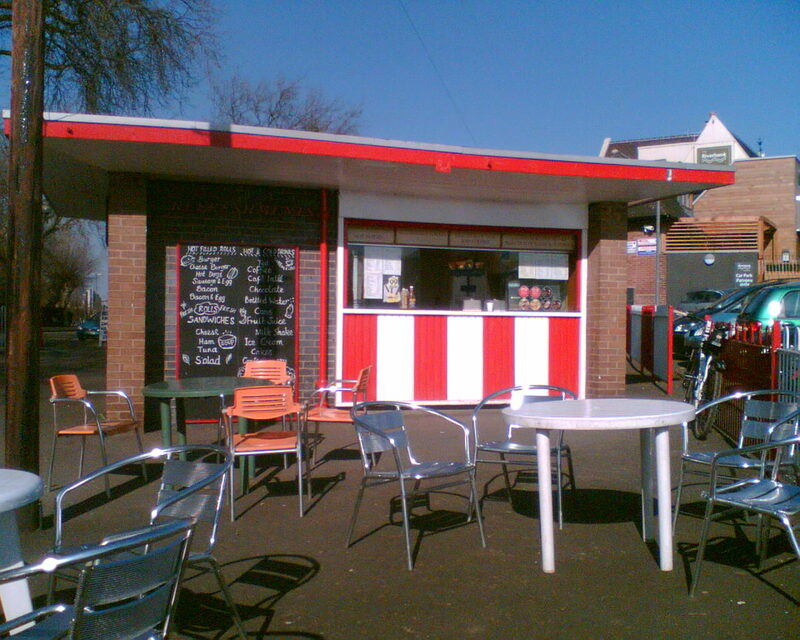 The north bank is the city side, and the south bank is the Borough of Rushcliffe, and more particularly, West Bridgford. The river is wide, and is reputed to have ten miles of steps. On the opposite bank in front of County Hall, there are canal barges moored, along with a couple of permanent house boats. 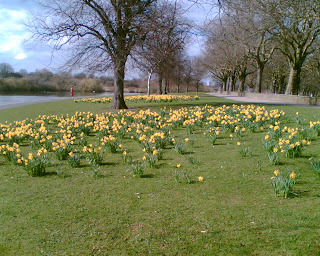 The Embankment is one mile from Trent Bridge to where we leave it and go in another direction. It beautifully follows the curve of the river for the whole distance. There are always loads of Canada Geese feeding on the grassy banks, and to avoid constantly watching that you don't step in their mess, I find it best to walk on the upper path for a short distance. Along the banks there are also Swans, Ducks and the occasional Coote, though the last is not easy to see as they're usually near the opposite bank. A few hundred yards into the walk and you come to the Wilford Suspension Bridge. This is owned by Severn Trent Water and reopened early last year after extensive repair work. It is the main foot and cycle route between West Bridgford and The Meadows area of the city. As you're walking, the bridge is on your left and immediately on your right is the main entrance to the Memorial Gardens with a fabulous archway honouring the dead of the two world wars. At the side of these gardens you find playing fields full of football pitches during the season, and a large open space out of season, which particularly at weekends is full of families enjoying their day out. There are also childrens play areas. 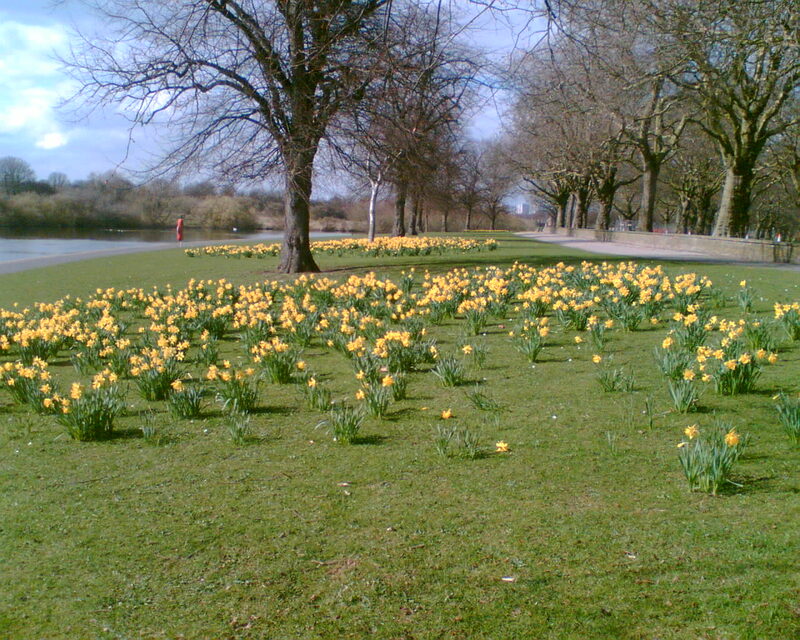 Continuing to walk along the river's edge at this time of the year, you are confronted with hundreds of yards of daffodils in mass clumps. The picture gives some idea of what it looks like. Against the back drop of the river and clear blue sky, the scene is a match for anywhere. We've now arrived at the end of the one mile embankment walk, and reached Wilford Toll Bridge, with its interesting Toll House, which is now a very nice take-away refreshment stop. Beside the bridge, there is a statue in honour of Sir Robert Juckes Clifton. As a light aside, Punch Magazine once claimed that the statue had the "worst pair of sculptured trousers in England". (Never say that I don't give you valuable information). Sir Robert is an interesting man. His family had been landowners in Nottinghamshire since the middle ages and their estate was centred at Clifton Hall. Born in Nottingham in 1826, educated at Oxford, lived in France for a while and returned to Clifton in 1861, when he stood as an independent candidate for Parliament. One of the main features of his campaign was his opposition to the "permissive bill" which was trying to limit pubs and alcohol consumption. He won. He went for re-election in 1865, and this was at a time when there were no private ballots, so when voting took place, there was invariably trouble. Election time sounds a lot more excitable than it is today, for it's reported that MP's employed 'rabble rousers' to try and swing the vote - Sir Robert's were known as 'Clifton Lambs'. It turned nasty as his supporters clashed with those of his opponent, Samuel Morley, and a right royal battle took place through the streets, which had to be quelled by the military. Sir Robert lost the election, but won the seat back in 1868. He died of typhoid in 1869, and the history books tell us that 20,000 people attended his funeral at St Mary's Church, Clifton, which he had previously built for the people of Clifton. 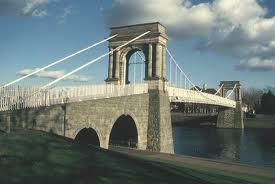 He also built the Wilford Toll Bridge in 1870 for the traffic to and fro his Clifton Colliery. Prior to the bridge, the Wilford Ferry had been operating for around 400 years. Nottingham City Council took over the bridge from the Clifton family in 1969, and realising that it was in poor condition, closed it to traffic in 1974. The centre span was demolished and replaced by a narrower foot bridge. It's exciting to note that the Phase 2 of the Nottingham Tram System between the City Centre and Clifton will use an enlarged Wilford Toll Bridge to carry the trams. It will also cater for pedestrians and cyclists. So, Sir Robert's legacy will live on in the 21st Century. 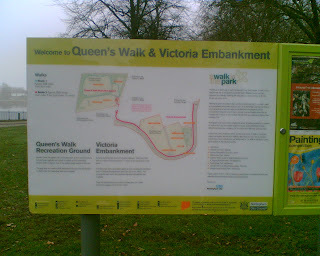 Leaving the Victoria Embankment, you turn right into Queens Walk (there's a distinct lack of signage, unless I missed it all). I was now in new territory. Reading my Nottingham history, I note that the walkway was named after Queen Victoria's visit in 1843 as she passed through the Midland Station on her way from Chatsworth to Belvoir Castle. It says something about the power of the monarchy, that you only have to pass by, to get something named after you. (Stop it John - no more digressions). 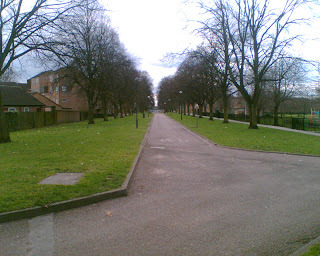 Queens Walk is 1Km long and was opened in 1850. The area was susceptible to flooding, and in 1862 trees were planted along its entire length on both sides to help combat this. I actually loved Queens Walk, and will definitely be back, particularly when all of the trees are in full leaf. It was a joy to walk down it in the bright sunshine, and pass by the impressive building on the right which is now used as a community centre. 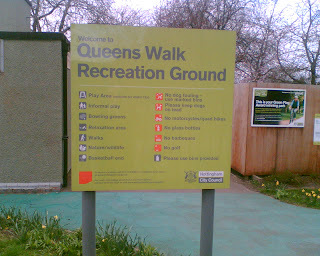 At the end of the walk, you come across the Queens Walk Recreation Ground. I went in for a much needed sit down. It was very pleasant, with a central grass area, childrens play area, basketball end, sensory garden and bowling green. One of the information boards said that if you walked around the shale track three times, you would have walked 1Km. (I think you're getting desperate with information sharing John). There's a lovely view of Nottingham Castle from one of the garden seats. "Nottingham town in the 13th Century was enclosed by pastureland, the 334 acres to the south were known as the Meadows. By the early 19th Century the Meadows was built on to provide housing for the growing city. However, an Enclosure Act passed in 1845 ensured some land remained as green spaces for public recreation and walks. Queens Walk and Queens Walk Recreation Ground remains part of the act". The Recreation Ground was originally laid out as a public cricket ground, and was made available for use between the months of May and September each year. It stopped being used for cricket after 1939. As part of the Enclosure Act, it must be one of the oldest public open spaces in the city. I was certainly glad to find it. The walk was nearly over, and as I could see the Train Station in the distance, I knew that there was not far to go. So leaving the Meadows area and crossing one of the main roads, I passed by the local Castle Rock brewery, and their Vat & Fiddle pub. The pub apparently is popular with train passengers, and people attending football and cricket matches. It is a haunt for those who like their real ale, and one day I must test their claim to have 70 single malts available. Someone has said that the name Vat & Fiddle was given because of its close proximity to the Inland Revenue buildings a short distance away. I do hope that's right, because I love that quirky humour. No doubt if its not, someone will let me know. To be honest, by this point I was knackered, and there was little walking left in me. It was to be the bus home, but first, a coffee from Greggs, and a sit down by the canal in front of the Magistrates' Court. Half an hour later I was on the No. 6, tired, but well pleased with the day. Another area of Nottingham has been ticked off my list of places to visit. I was down not far from the Notts area only the other day, at Elvaston Castle. Yes, it's all looking Spring-like. Time to dust down the lawnmower. Thanks for your comment Dominic. I didn't know Elvaston Castle, so checked the website. It looks a wonderful place, but I was sorry to read that the Council may be planning to sell it off to private developers. It will be a loss if public access is denied.